Media reports this week of a new food safety scare has dealt a fresh blow to China’s food industry. Worries over the quality and safety of food grown in the People’s Republic are nothing new. Last year alone, Chinese shoppers dealt with painted oranges and toxic cowpeas. But the new fears concern the dairy industry, which is still recovering from a scandal in 2008 that killed six children and hospitalised thousands of others. China Economic Net reported Thursday that some dairy producers were adding cheap protein extracted from leather to watered-down milk to pass protein checks. The “leather milk” allegations closely mirror what happened in 2008 when producers cheated similar checks by adding toxic amounts of melamine. Protein from leather is not known to be dangerous to humans. But the leather apparently being used by unscrupulous milk producers has been dyed or cured. These processes use potassium dichromate and sodium dichromate: toxins that may cause osteoporosis in adults after long-term consumption. Instead of strengthening bones, China-made milk may be breaking them. Coincidentally or perhaps preemptively, the Ministry of Agriculture said the Saturday before the story broke that it would step up inspections of fresh milk with 6,450 random checks this year. Oddly, it said only 30 percent of the checks would test for signs of leather protein whereas 100 percent would look for melamine. This is not the first case of leather protein in China either. 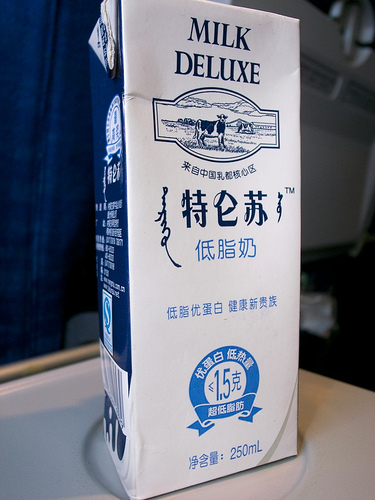 According to China Economic Net, “leather milk” was first found in Shandong Province in 2005, and in March 2009, inspectors in Zhejiang Province’s Jinhua City found traces of leather protein in five out of eight batches of dairy products from Jinhua Chenyuan Milk Co., Ltd.
Regulation of China’s dairy industry has apparently improved since Premier Wen Jiabao admitted in 2008 that the government’s supervision was poor. The Ministry of Agriculture claimed last month that it found no banned additives in all of the 3,307 samples of fresh milk it tested during the second half of 2010. Melamine content was also within regulatory limits of 2.5 milligrams per kilogram, it said. True or not, reports like these can be a self-fulfilling prophecy. Every time an allegation over safety surfaces, Chinese shoppers rush to switch from local goods to foreign imports, even though the latter is often much more expensive. Local producers, bereft of customers, struggle with ensuing plummeting demand. Inevitably, a desperate firm somewhere is caught cutting costs to stay afloat, which puts more pressure on the industry. This is what is happening in the dairy industry. Since the events of 2008, foreign milk powders have captured half of China’s market, up 10 percent in two years. Chinese producers, meanwhile, have seen their sales plummet and profits squeezed as consumers shunned their products. Every new scandal – real or imagined – perpetuates the cycle. It is vicious but the result of too many safety scares for the Chinese public to stomach.